96% natural ingredients and formulated without Parabens, SLS and Silicones. 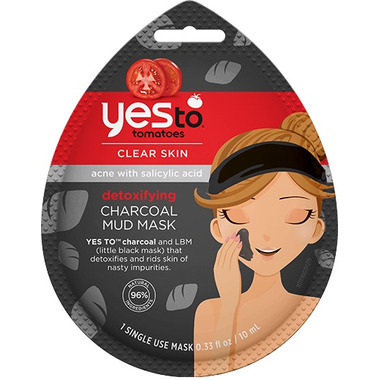 Usage: Apply a generous amount of Yes To Tomatoes Detoxifying Charcoal Mud Mask to clean skin and let it work its detoxifying magic. Rinse off with water to reveal your clean, clear, and beautifully conditioned complexion. Ingredients: Water, Propanediol, Bentonite, Kaolin, Glycerin, Magnesium Aluminum Silicate, Galactoarabinan, Aloe Barbadensis (Aloe) Leaf Juice, Charcoal Powder, Allantoin, Citrullus Lanatus (Watermelon) Fruit Extract, Lens Esculenta (Lentil) Seed Extract, Solanum Lycopersicum (Tomato) Fruit/Leaf/Stem Extract, Gingkobiloba Leaf Extract, Cucurbita Pepo (Pumpkin), Chamomilla Recutita (Matricaria) Flower Extract, Aspalathus Linearis Extract, Xanthan Gum, Iron Oxide (Ci 77499), Alcohol, Sodium Hydroxide, Phenoxyethanol, Fragrance. This mask is awesome!!! It felt so nice on. After use my skin felt soooo clean, super soft and had a glow. Going to buy the bottle version because I want to use this regularly.